With next to no-budget, quite a bit of stubbornness, lots of inventiveness, and an open ear, Rinus established - as it quite appropriately was described in this year's Tuned City-conference program booklet - one of Berlin's most uninstitutional institutions. From the south eastern outskirts of town, das kleine and Rinus together slowly got sucked into the city, where earlier this year they settled - for the time being - in green 'n' upcoming Neukölln, as did and do a great many other seers, dreamers, drifters & hipsters. It was there, in the Weserstraße, that I joined him in the first week of this year's july, on the occasion of das kleine's contribution to Tuned City, an "exhibition and conference project" that took place between july 1st and 5th 2008, and which "proposed a new evaluation of architectural space from the perspective of the acoustic". "Wherever you go, there you are ..."
Upon arrival at the Berlin Hauptbahnhof on the 30th of june 2008, I took one of those double-sized city-style harmonica buses to Neukölln. It was early in the evening but long past rush hour. The bus was pretty much empty during most of the 9 km long ride, that was accompanied by an awful lot of squeaking, rumbling, rambling and wind whistling. I sat down somewhere in the middle of it all, with my luggage. As is my habit, there was a dictaphone in my pocket, and it was recording. Onto an old cassette tape, one of the many hundreds of tapes that FlexRex found with the garbage this year in the streets of Montreuil, and for which I heartily thank him. Unless what's on them is very special or peculiar (which mostly it isn't), I recycle these tapes by using them to record. One or two stops from the station, two old ladies (both will have been in their late seventies) got on the bus. They sat down just opposite to me. They busily giggled and chatted, their bags on their knees, meanwhile swaying and bumping along with the bus that continued to rush down southwards along Berlin avenues. One of them had a particularly sharp voice, with which she pointed out several buildings - most of them churches - to her friend, adding all sorts of remarks, anecdotes and stories about them. Obviously they were from Berlin, and they must have been living through much of the city's eventful recent history. The sound of their voices, thus embedded in the loud noises of the bus ride, struck me as a remarkably 'tuned' sonic welcome to Berlin ... It also reminded me of a very just observation by Rod Summers, who - asked in an interview what was 'the sound of Maastricht' - pointed to: "the sound of people talking to each other in Maastricht dialect". That, and the sound of the town hall bells. Thus the two ladies babbling on about neighborhoods, churches, squares and palaces, and all that was there 'früher' ... to me this was 'the sound of Berlin'. That, and maybe the sound of sirens. It therefore probably was unavoidable that the Sirens exhibition at general public that was part of the Tuned City activities had to be something of a disappointment. In turn this reminds me of Ryoji Ikeda's monumental spectra [paris] installation next to the Tour Montparnasse, commissioned by the city of Paris for this year's Nuit Blanche, during the first weekend of october. It was actually by accident that I stumbled upon Ryoji's installation (whose work, btw, I was/am hardly familiar with). The Immanence gallery is just across from the Tour Montparnasse, and when I left the show to walk back to the Montparnasse station there were whiffs of pretty abstract electronic music floating over from behind the tower. So I became curious and headed in the direction from where the sounds came. It lead me to a most amazing light sculpture. Using a square grid of 8 x 8 high intensity, narrow beam floodlights placed at 2 meter intervals apart at the foot of the north wall of the Montparnasse office building, Ikeda erected an immense cone of light, that was a second - and far bigger - tower. Overwhelming, really, breathing precision, power and grandeur. 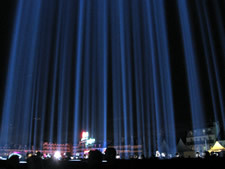 It was the parisian version of spectra, another version of which recently was installed in Amsterdam, on the occasion of Dream Amsterdam 2008. Ryoji continues to adapt his works to specific places and circumstances. Thus the sounds were a version of his matrix. Loudspeakers placed around (and maybe also within, I am not quite sure) the grid of floodlights broadcasted patterns of sine waves of varying frequencies, the perception of which changes because of your moving about, as well as because of the movements and actions of the (many) other people walking around. 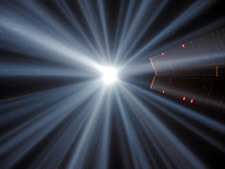 Spectra/Matrix was convincing as a dramatic but accessible modification - a re-tuning - of public space; experiencing it a very social event, with hundreds of visitors wandering in amazement around and within the grid of sounds and lights. But the more I looked up into the fixed and luminous point of the needle, the more I became convinced that the sinewave sounds were not the right sounds to accompany this monument. What I had wanted to hear - and what I clearly began to imagine hearing when I walked away from the tower - is a music based upon the sound of air-raid sirens ... Though of course Ryoji will not agree, it would have been even better. And on the tube back home I closed my eyes and imagined it thus at Berlin's Alexanderplatz ... It was near to perfect. Of course it all ended up on the old cassette that continued to eavesdrop along, all the way. Due to the cassette's age and somehow somewhat stiff mechanics, it ended up on there in a rather peculiar way, though. The recording comes with a bad case of wow and flutter, that over time slowly creeps in and then gradually is getting worse. It imposes itself as an additional layer onto the recording. You can listen to the bus ride in "Jetzt erst, jetzt ... Neukölln", which is the first in the series of radio-dicta-phonic sound reports that will audio-document my stay at Neukölln, Tuned City and das kleine during the first week of this year's july. Together these reports are going to constitute the 14th edition of Raudio, which will evolve into its final form over the next couple of weeks or so. I got off the bus in Neukölln, on the corner of Sonnenallee and Panierstraße, where Rinus was waiting for me. That evening we walked over to Kreuzberg, to Madame Claude's in the Lübbener Straße, where Rinus, Magnus and Mireia performed their Topmodel. There were other performances as well. One before and one after. These I choose to forget.